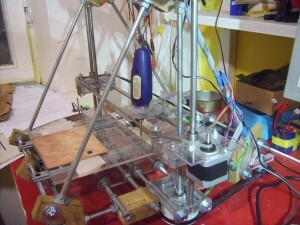 I started to build my own reprap clone about a year ago, now, finally it is almost making something useful. 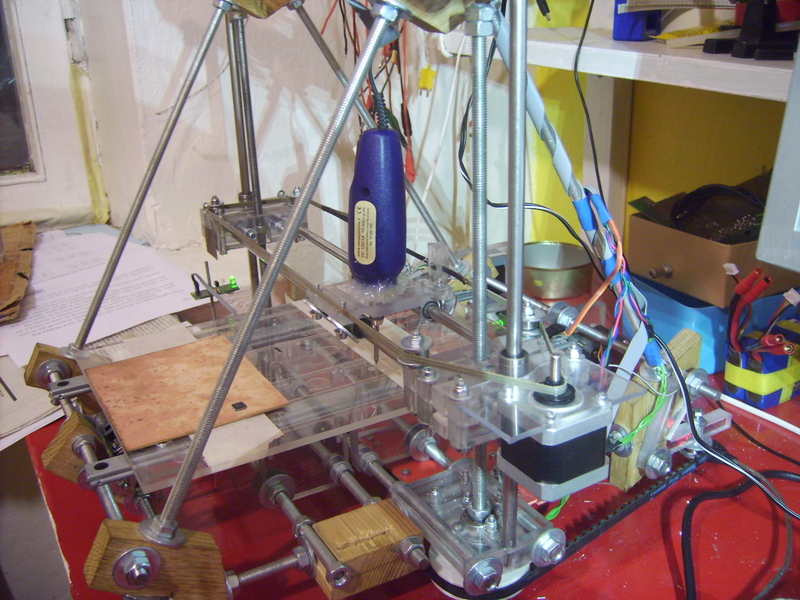 I used way to build that shouldn't ever be used: I took reprap Mendel design and started to make it with hand tools. Now I know that RepStraps are made for hand making and repraps are made for printing, stupid me. I am using Generation 3 electronics, before I started, they weren't deprecated, but apparently they are now. Finally. I have much to rant about them. They use expensive and BIG connectors, like RJ45, IDC, screw terminal and what else. There is no standards in connectors. 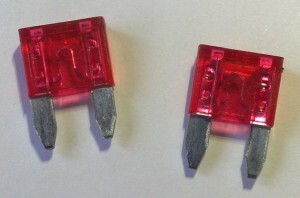 The pinouts and connectors vary from board to board. 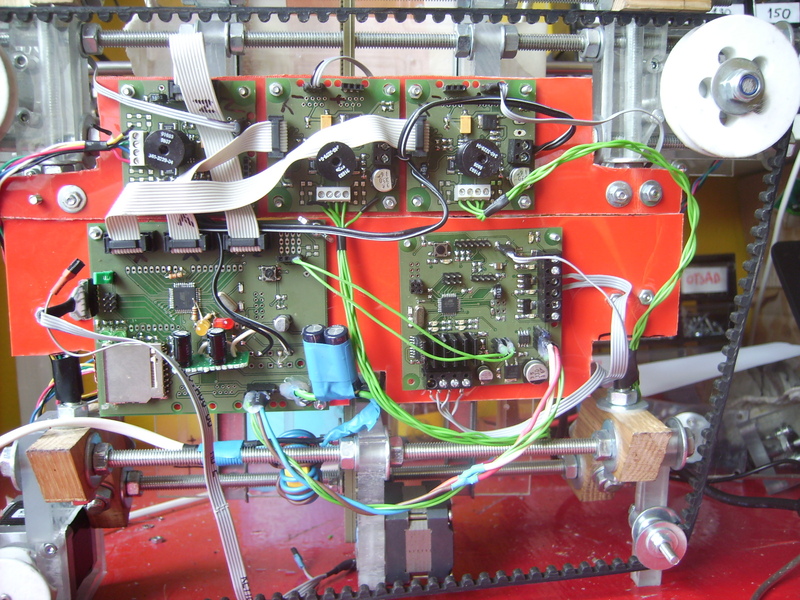 Every board has its own 5V regulator and it has to use big and clunky ATX power supply. 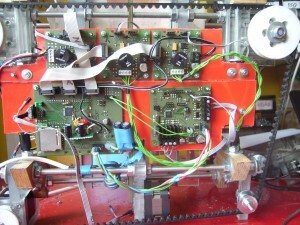 Why not make single board solution, one regulator and get rid of the enormous PSU. Although it has big and fancy extruder daisy chaining network planned, the extruder requires point-to-point wiring to work, like what. And firmware.. the firmware. Original firmware is just awful. Poor performance and poor coding, sad, sad. I moved to Teacup firmware as fast as I could. And random routing problems too: it has non 45 degree traces, via and track sizes are more or less random and so on. Very amateurish. Unfortunately there isn't much better electronics out there. I made one 4x4cm version that had self made mosfet bridges to control 4 unipolar stepper motors and everything else needed for a 3d printer, but PCB order of the board failed and it doesn't seem useful so I ditched the idea. I have a plan to route 5x5cm board that has Atmega16u4 and 4 stepper controllers, but I havn't had the time yet. Milled traces compared to TQFP44 package. As I have failed from time to time in building a working extruder, I finally had it. I took my dremel and hotglued it to 3d printer. Little bit of playing later and yes, it can mill PCBs. The printer moves in 0.1mm steps. With the milling bit I have now I can make 0.4mm wide lines (clearance=0.4mm) and the smallest trace I could do is 0.1mm wide. 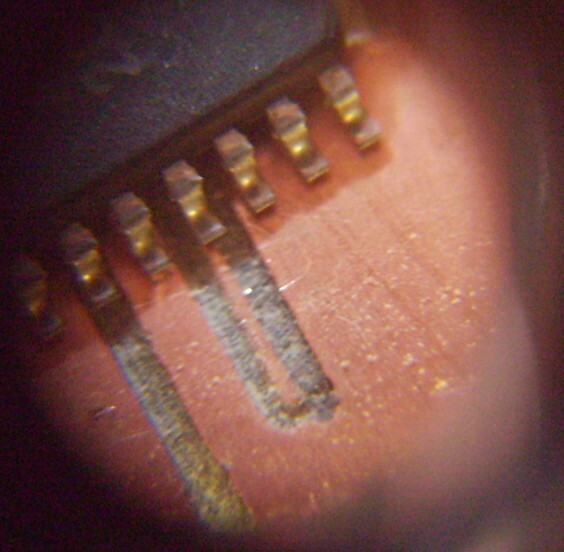 Will try to mill some gerbers after re-routing Half Ohm PCB. I tested my reprap and managed to short something out. I didn't notice it first but after a couple of seconds I saw smoke coming from under my table. 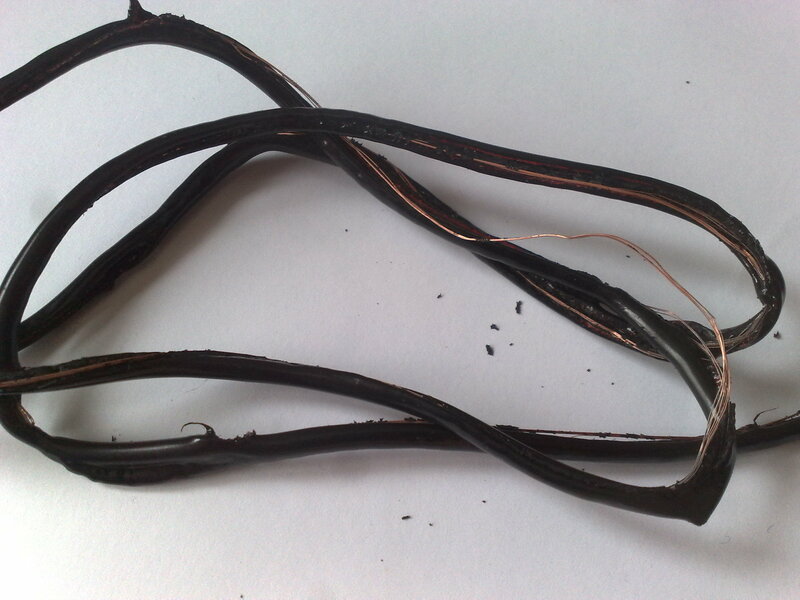 The wire connecting my power supply and power system had almost liquefied and was giving out tons of smoke. I unplugged it and it stopped. My other power source - the battery, had 10A one what went out right away. Next job - make sure that every power wire is fused. The lesson for today - use fuses. There is never enough of them! Next time when making a project, add some. 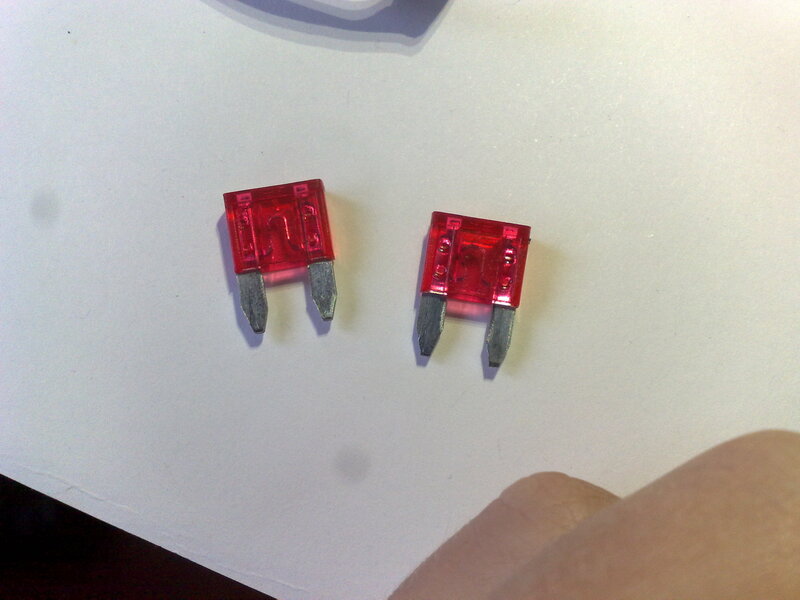 And if you want to protect ICs then self resettable fuses/PTCs.